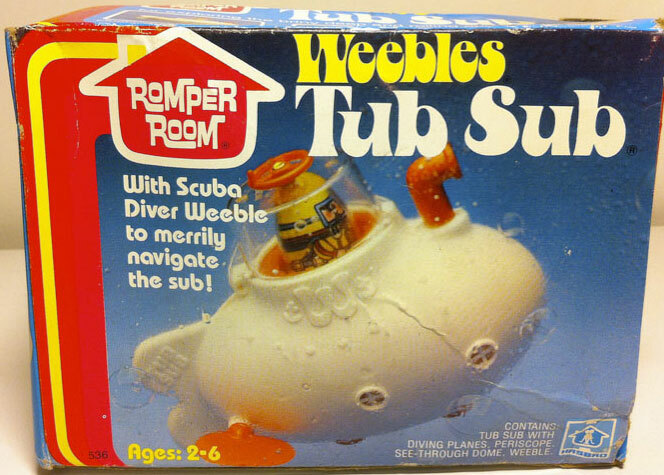 Description: The Weebles Tub Sub floats merrily along until you pull up the periscope.... then it dives down to the ocean floor! The sub rolls on land too! 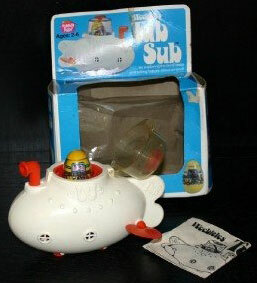 Set includes a friendly diver Weeble figure. Submarine - HTW322 - White oval-shaped submarine with a red periscope on top, 2 red paddles on the sides, and the paddle spin when the sub roll on it's wheels. Both sides of the sub have 2 small round port hole windows and the back has a white "tail fin" with "Tub Sub" molded-in on both sides of the "fin". The top of the sub has a round clear plastic "hatch", hinged on one side to lift and lower the hatch over the sub seat. The top of the hatch has a red wheel. 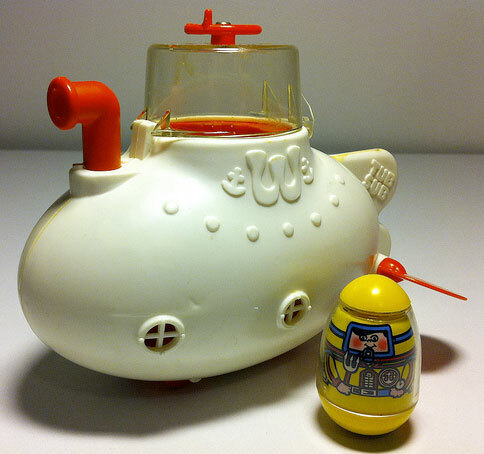 Weeble Diver - HTW36 - Yellow base, yellow top (hair) diver with red/blue scuba/diving gear. Has a facemask and holds a fishing fork in one hand. Marked "©1976 Hasbro, Pat. 3,805,444". Featured in 1977 Sears Christmas Wish Book (page 491) - Price $3.77. Featured in 1981 Sears Christmas Wish Book.